Non-floral auction centerpieces at "Night at the Museum"
This photo is from a “Night at the Museum” benefit auction. Each table had a creative centerpiece showcasing a different museum around the United States. In this shot, the National Baseball Hall of Fame museum is featured. Many of the galas I work use a floral centerpiece on the table. I certainly enjoy the freshness flowers bring to an event, but I’ve also seen some interesting non-floral options, especially when it comes to school auction centerpieces, as the one in this photo. Why do nonprofits opt for a non-floral arrangement? As attractive as they are, flowers can be expensive. They become a “nice to have,” not a “need to have,” so they can be quickly cut from a budget. 2. Have children create them. Another advantage of non-floral centerpieces is that many can be made or assembled by children (though the one in the photograph was not). Put the kids to work assembling the centerpieces — it’s especially useful if you’re overseeing a school auction or a nonprofit which benefits children. 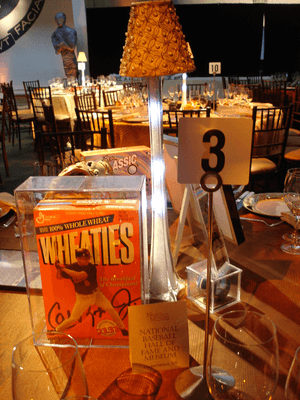 If you decide to sell the centerpieces at the gala, the “kid-made” aspect can help the centerpieces sale price. Some flowers can set people off into a sneezing frenzy. Non-floral centerpieces eliminate that from happening.